Ronan O'Gara's life after rugby is proving to be almost as eventful as his stellar career on the pitch. Right now, he's considering an approach from an agent on behalf of the French federation to come on board as part of Jacques Brunel's coaching ticket for Japan. On last night's Off the Ball, he said such a move is far from a done deal but if it materialises, it would represent the latest addition to a CV of real quality. Having spent four successful seasons at Racing 92, the Munster legend moved to New Zealand to assist Scott Robertson at the Super Rugby powerhouse Crusaders. Add in his short stint on tour with Joe Schmidt's Ireland and the 42-year-old has been gaining experience at every step; working in rugby's most fruitful hothouses. From the outside looking in, the current French set-up does not appear to be in the same progressive state but the opportunity to help effect change in a pressurised environment on the biggest stage will appeal to a man who was once the biggest of big game players. Whatever happens in Japan, his reputation won't suffer by association. The experience will stand to him. France have identified a man who commands instant respect based not only on his achievements as a leading light for Munster and Ireland but for his coaching at Racing in particular where he was handed responsibility upon arrival and thrived as a result. Working under Laurent Labit and Laurent Travers, O'Gara was the defence and kicking coach as the Parisians ended their long wait for silverware by winning the Top 14 for the first time in 36 years and reached the Champions Cup final. At the Crusaders, he has been in charge of a potent backline under the man many believe will be the next All Blacks coach in Robertson. Working within the New Zealand system and within Super Rugby has exposed the one-club player to a new style of play. Along the way he has been picking up information that will ultimately inform him when he takes his first steps as a head coach. O'Gara's approach to the job has been to patiently build experience. He has been in no rush to jump into a leading role until the time is right. He has much to offer and the French are willing to turn to him to fix a defence that was all too fragile during a disappointing Six Nations. With a young half-back pairing of Antoine Dupont and Romain Ntamack learning on the job, O'Gara would seem like a perfect mentor. He could even do the job and go back to the Crusaders for the start of the 2020 Super Rugby season if he is staying on beyond the end of his current contract which expires at the end of this year. It all makes you wonder why the IRFU have not tried to hijack the move? Certainly, O'Gara must be high up on Andy Farrell's list of potential assistants now that Stuart Lancaster has ruled himself out of a role in the post 2019 ticket, but he could add value right away. Ireland also endured a difficult Six Nations, albeit one that saw them finish third with three wins out of five. Schmidt keeps a small and tight-knit backroom team, but there is surely always room for more expertise and a fresh voice. A veteran of three World Cups as a player, O'Gara knows the territory well and he is familiar with the set-up having toured the United States in 2017. He has worked with some of the world's best players and comes with ringing endorsements from many, while his perspective has been broadened by working in highly competitive environments France and New Zealand. Their half-backs are struggling, but O'Gara has a long-standing relationship with the pair of them, while their understudies would surely benefit from his guidance. The Six Nations saw teams use tactical kicking as a weapon like never before and the former out-half is an expert in that field. Of course, the current unit coaches are on top of their briefs but there is scope to improve Ireland's unstructured attacking play in particular and O'Gara's experience of working in the southern hemisphere's elite competition would stand to him in that regard. Nobody does chaos like the Kiwis. 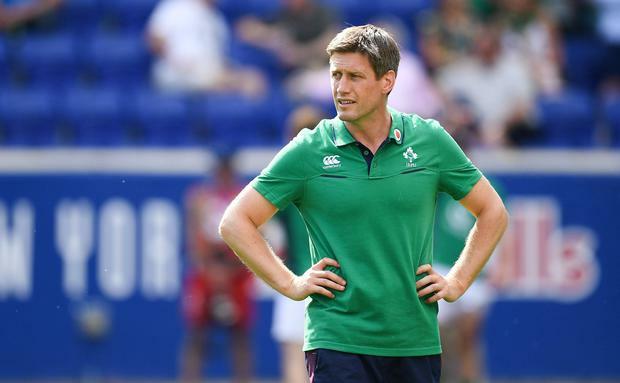 Ultimately, there is a sense that Munster and Ireland will one day benefit from O'Gara's determination to live and work abroad to further his coaching prospects. But as he prepares to join the French coaching ticket for the World Cup, Schmidt and David Nucifora must be asking themselves if it is time to accelerate that process and bring O'Gara home.